You might make great beer, but so do lots of craft breweries. 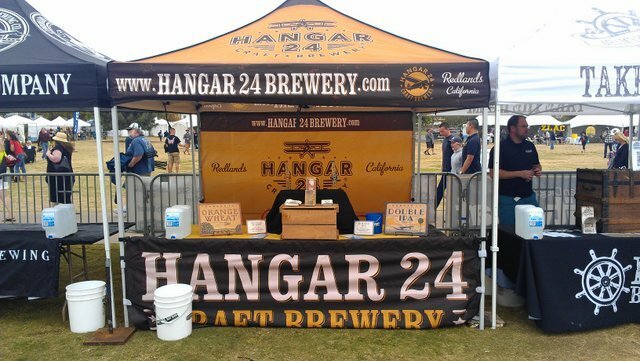 At a beer event, you must stand out with a professionally branded beer booth — tablecloth, banners, signage, jockey box cover and cool swag like stickers, bottle openers and custom buttons. EDITOR’s NOTE: We’d like to thank the amusing and insightful folks from San Diego-based Kick Boom Pow for providing the excellent article below. With a particular focus on beer events and festivals, Kick Boom Pow produces quality branded beer gear for craft breweries — from jockey box covers and banners to tents and tablecloths (and beyond). How does Kick Boom Pow know so much about branding? Well, they attend tons of beer events every year, producing the gear, setting up booths and working it themselves. It’s the same reason we asked these event brand experts to pen this piece on beer event tips. These guys and gals understand beer events are the quickest and easiest way for craft breweries to market beer and showcase brands. After you read their advice below, surf over to their website to learn more about Kick Boom Pow. 1. Is this love or just another beer event? Beer events are now as ubiquitous as refurbished wood and Edison lights in a hipster bar. So how do you choose the right event for your brewery? You have to ask yourself two simple questions: What do you hope to gain from attending the event? And how established is your brewery? If you are a start-up or a small brewery looking to launch your brand, gain future cult followers and potentially new accounts, then your best bet is to get out there and infiltrate as many local craft events as you can. If at all possible, find someone dedicated to working a local beer event nearly every weekend. If you have problems finding events, check out local magazines or go to craft-centric websites and look at their event pages. BeerAdvocate.com and your local Brewers Guild website are also two great resources to start with. Why go to so many events? Because beer events are the fastest and easiest way to get a ridiculous amount of people to try your product that normally otherwise wouldn’t have. That tidbit, my friend, is worth its weight in gold. Now, on the flipside of the coin, if you are a well-established brewery looking to stay relevant and maintain your market share, then you need to focus on quality, not quantity. Since you’re already one of the cool kids, it’s time to be selective on who you go to the prom with. As we know it, beer events can be a dime a dozen. So make a list of the top 25-50 events throughout the year you feel have the greatest reach on your target audience. Don’t limit yourself to local events only; think big, as in nationwide. Then get out there and bring your A game. Be that brewery everyone at the Great American Beer Festival is talking about and be the one that raises the bar for the rest of them. Lastly, for you mid-sized breweries out there, think of it as a chocolate-vanilla twist, a combination of the two approaches is your best plan of action. A jockey box is an insulated container containing ice and water, used to cool beer being served on tap in temporary locations. Spruce up your old, used jockey box with a custom cover like this. Now that you’ve selected what beer events are right for your brewery and you are out there pumping your sweet nectar of the gods straight into the veins of the masses, you need to focus on one of the most important aspects of a beer event: marketing your brand the RIGHT way. In a sea of thousands of people and 30 or more other breweries, how are you measuring up to the competition? I can tell you this: If your setup looks like you’ve been brewing beer in a bathtub out of your grandmother’s garage, you won’t be remembered fondly and you’ll probably be passed up by many. Your first goal is to get people to like your beer and your second goal is to make them remember who you are so they will buy your product later. Next time you’re at a major beer festival, take a look at what the oldest, most well-respect breweries are doing to market themselves at events. Now look at what you are doing and determine how you measure up to them. We get that money doesn’t grow on trees, so for you start-ups and smaller breweries, we recommend you start small. Think about getting a branded table cloth and a decent banner that can be used with or without a tent. If you have a jockey box, do yourself a huge favor and cover it at the very least with a plain tablecloth or piece of burlap you pick up at the craft store for a few bucks. For mid-sized breweries, you should already have a branded tablecloth and banner by now, so your focus should be on getting a branded tent, a branded jockey box cover and some cool swag like stickers, bottle openers and custom buttons. You don’t want to waste a rare barrel-aged batch at a college drunkfest, where people are only asking you to, “Give me whatever has the highest ABV, brah.” We think it’s common sense, but we’ve seen this aspect egregiously overlooked.For the big fish in the pond, your focus should be on the details. Think of your booth or table at an event like a storefront. You spent hours thinking about painting your brewery walls Habanero Chile versus Cherry Tomato and years cultivating your beard like a Bonsai. So why not treat your presence at an event with the same respect? Your branding should be consistent across all fronts no matter where you are. You should be thinking about branded backdrops to hang off your tent, full custom-designed jockey box covers and table decorations such as branded chalk signs and what’s on tap signs. At the end of the day, the more pulled together you look, the more credibility you have. You don’t bring a knife to a gun fight. So why would you bring a blonde to an Amberfest? Selecting the right beer for the event is another crucial element of a well-executed event. This thought path is designed for the breweries out there with several styles under their belt; don’t worry, you smaller guys will get there, so for now just bring a decent selection (1-3) styles of your core beer. For the rest of you, you should once again be thinking about what your marketing goals are. If you’ve been around long enough, you may want to keep people interested by sending one of your special releases or small batch brews. Personally, we think it’s a great idea to bring a specialty beer along with a beer from your core product line that may need a little boost on the market. Everyone’s looking for the next shiny object, so get them to come to your door by dangling that carrot and then make them remember how good your other beer is, since that was what got you the notoriety in the first place. If you decide to skip the specialty beer, send a lesser known style that you want people to start buying. Most people don’t realize how many other styles you brew since they only know you for that one style everyone drinks already. Next, you should consider what type of event it is, who your audience is and what the weather will be. Seriously, hardly anyone wants to drink a porter on a scorching hot day or a lager at a Christmas festival. You also don’t want to waste a rare barrel-aged batch at a college drunkfest, where people are only asking you to, “Give me whatever has the highest ABV, brah.” We think it’s common sense, but we’ve seen this aspect egregiously overlooked. Here’s a good example of how not to present your craft beer at a festival. No tablecloth, no signage, no jockey box cover, no personality and (thus) no customers. There are all different types of people out there, and we are all special, unique butterflies. So, who do you send to work a beer event? The answer is not your head brewer if he is a borderline agoraphobic introvert or some eye candy whose favorite beer is Blue Moon. Instead you should be sending your best sales representatives to get out there and do what they do best, talk to people and sell beer. If you are a mid to large brewery, consider establishing an event person or team dedicated to setting up and decorating your events. Especially since your sales person may not be thinking about how your sign wasn’t hung straight enough or whether or not the flowers are clashing with the tablecloth. As the old adage goes, it takes a village. Choose wisely and find the right people for the right job. As my dad would say: “Prior proper planning prevents piss poor performance.” Take a page from that grumpy old man because it’s far from codswallop. We’ve been around the block enough to have seen it all from empty CO2 tanks, missing jockey boxes, broken couplers, leaking lines, no washers, foamy beer or no beer at all. Event planning 101 will tell you to always have a backup plan or at the very least backup equipment. Know exactly where you can rent a jockey box in a pinch or fill your CO2 tank on a Sunday. Bring a draft kit with all the parts and pieces you need to replace, tighten and repair a jockey box. Get yourself an event kit. What is that? It’s a kit that has everything you need to setup a proper event, from black duct tape to zip ties to extra swag, banners and tablecloths. We can’t tell you how many times we’ve helped bail out some of our brewer friends in a jam with our Mary Poppins bag of tricks. Lindsey Rogers is a co-owner and craft beer event planner for Kick Boom Pow. She can be reached at [email protected]. RT @BrewandCovered: Do you currently, or plan on doing beer events? Do it right! “Prior proper planning prevents piss poor performance! Do you currently, or plan on doing beer events? Do it right! “Prior proper planning prevents piss poor performance! Sheila Cunningham Pollock liked this on Facebook. Brian Wright liked this on Facebook. @CraftBrewingBiz @Kick_Boom_Pow Great article! Will take those 7 P’s seriously and prepare a Mary Poppins bag of tricks ASAP.